Ideal for individuals looking to embrace their cancer journey and soak in the joy of time in Nature! 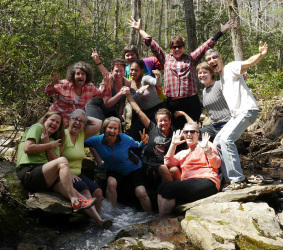 We offer our Cancer Wellness Retreats to help others who are interested in learning ways to better manage their energy, open their hearts, and connect with others who are dealing with similar issues. Connect, laugh, and share with others. Explore what is really on your mind and in your heart. Applications are made available roughly 2 months before a retreat and are open to North and South Carolina residents. We are excited to partner with Cheryl LeCroy of Creative Juices Consulting on our Food for Healing, and Rainbow Dinner workshops plus our Cancer Coaching! Professionally recorded and produced, this 2-CD set has been carefully crafted as a tool to reduce stress, quiet your mind and help you drift off sleep. "Before listening to this, I thought it was just another meditation CD. It is NOT!!! ...I highly recommend it for anyone who wants to be transported to that special place within." As part of our Cancer Outreach Program, CD's are available to Cancer Survivors at NO COST*.